PayPal is Available for deposits! Winnie- 4 lbs. AKC reg. She's a great mom and loves to fish! She is retired! 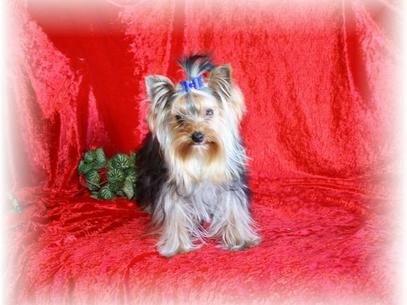 Here is TOBY my stud at 3 1/2 lbs.He's AKC registered. He has a great coat,personality and temperment. He is Blue/Gold. He has great Parti lines. This is Lidda Gurl she weighs 4 lbs. She loves to be held and pampered.She's one of our biggest babies! Peaches and ZZ have a new litter of 3 girls. They were born on 12/5/18.They are AKC registered. They are up to date on shots and wormings. They are vet checked at 6 weeks old. They are sold as pets unless otherwise arranged. All the babies are sold. We should have another litter in a couple months Please email me and ask to be on the waiting list if you would like to add a Fur Baby to your family!